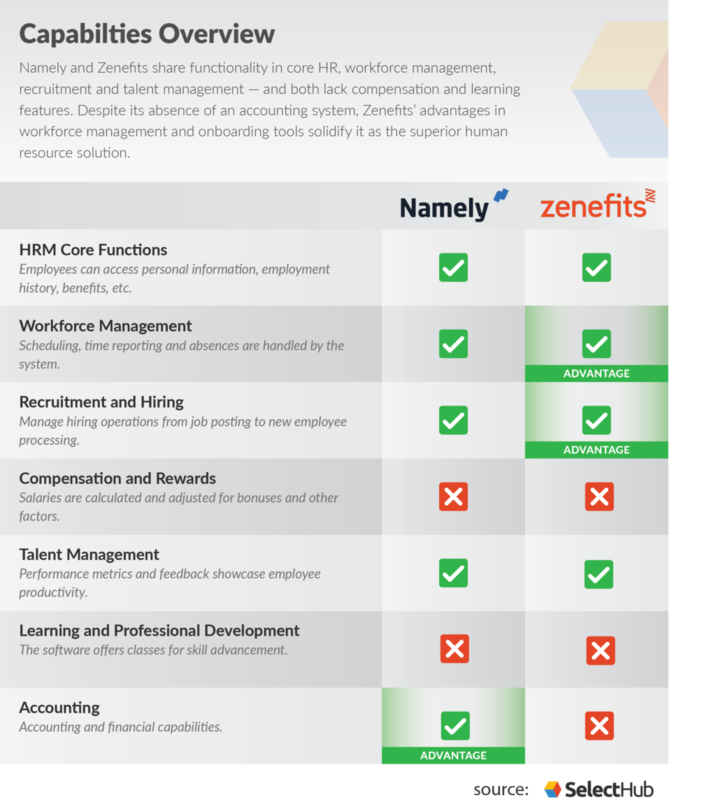 Namely vs Zenefits - Which HR Software Wins in 2019? Namely provides full HR capabilities, but one of its strongest differentiators is its benefits administration. The benefits administration module is especially unique, as you can both use the software and a consultant. Namely employs expert benefit consultants to help you choose the right packages for your employees. Most HR software vendors leave the benefits administration to the software, but Namely can walk you through the whole process if you need it. Zenefits’ software provides HR management for small businesses and mid-sized companies alike. One of the reasons it’s appealing to small businesses? It offers a free version. If all your business needs is employee management and benefits administration, you can use Zenefits completely for free. The software works in an app-based system, where there’s an app for payroll, benefits, etc. All of these apps are available to see and use on the main dashboard. From benefits to time off, HR departments can reduce their manual work as each app shares information and is presented in an easy-to-use interface. As you probably gathered from the name, one of Zenefits’ biggest selling points is its benefits. Offering medical, dental, vision and life insurance plans, there’s no shortage of options for your employees.  In fact, it offers thousands of plans from hundreds of providers. Your employees don’t have to be restricted to just “the low or high deductible” anymore. With the available plans, you can offer the most relevant ones for your employees based on location and needs. Both of these systems share much of the same core functions and provide a base as a comprehensive tool for human resource management. Namely’s workforce management features provide a comprehensive time and attendance system complete with time clocks, tracking and schedule editing, as well as more advanced features such as reports and integrated payroll processing. All information related to scheduling is stored in one place and can be managed and viewed by all members of an organization. Reporting dashboards provide managers with a complete view of their company’s workforce management metrics, with visualizations illustrating overtime, time off requests and more. Zenefits is primarily an app-based platform, and the software’s workforce management features are no exception. The software’s time and attendance app handles standard scheduling features like clocking in and out and overtime management along with compliance and anti-fraud measures. The Zenefits Time Off mobile app, as the name implies, manages the approval of time off requests. Employees can request off through the app, and team leaders can approve or deny the requests through the dashboard or via an email link. In addition, the app can integrate with Google Calendar, iCal and Outlook. The Time Off app can also be used to define time off policies — the system even offers built-in policies to choose from, as well as customization options. The ease of use of Zenefits’ app-based workforce management system places the software above Namely in this feature category. With Zenefits, workforce management is simplified. Zenefits’ workforce management features, including time off requests, holidays and mobile capabilities. Namely provides onboarding dashboards where new employees can fill out hiring documents, complete with eSignature capabilities. New hires can complete their onboarding process independently, using the software as a guide. Zenefits handles the entire process of hiring new employees post-selection, including offer letters, background checks, tax documents and benefits enrollment. The Zenefits platform gives new hires the tools to complete their own onboarding steps. In addition, the software provides features to automate all measures concerning the new hire. Email reminders automate messaging surrounding onboarding, offer letter templates can be created and compliance features are built-in. Also, all information entered by the employee is stored in the system and updated in each piece of the Zenefits suite. Zenefits holds the advantage in the category of recruitment and hiring tools. Both systems primarily manage onboarding, but have little pure “recruitment” features, like job postings. Zenefits’ onboarding features are more all-inclusive than Namely’s features, with the inclusion of additional processing functions and data integration across the suite. Both Namely and Zenefits manage standard payroll functions but have no compensation or reward system. Outside of payroll, compensation features generally handle base salary administration, wage adjustments and bonuses based on performance. Namely and Zenefits do not provide these tools. Get our HR Software Comparison Report. Talent management is a strong feature for Namely. Like any worthy talent management module, Namely provides onboarding, reviews, goal setting and more. What sets it apart, however, is its ability to “tag” employees. By tagging an employee’s skills, it’s easy to track their development as they add to and improve their skill set. In addition, as Dave Foxall at HRMSWorld describes, you can use these skills tags to create teams tailored to a specific project based on the required skill set. Zenefits’ talent management system mainly handles performance reviews. All review information is organized in a dashboard with the ability to group employees. The software includes templates for multiple reviews types which can be adjusted according to the ultimate intention of the performance review. Namely and Zenefits provide different talent management functionality. However, one is not necessarily better than the other. The systems both offer good tools for evaluating performance. 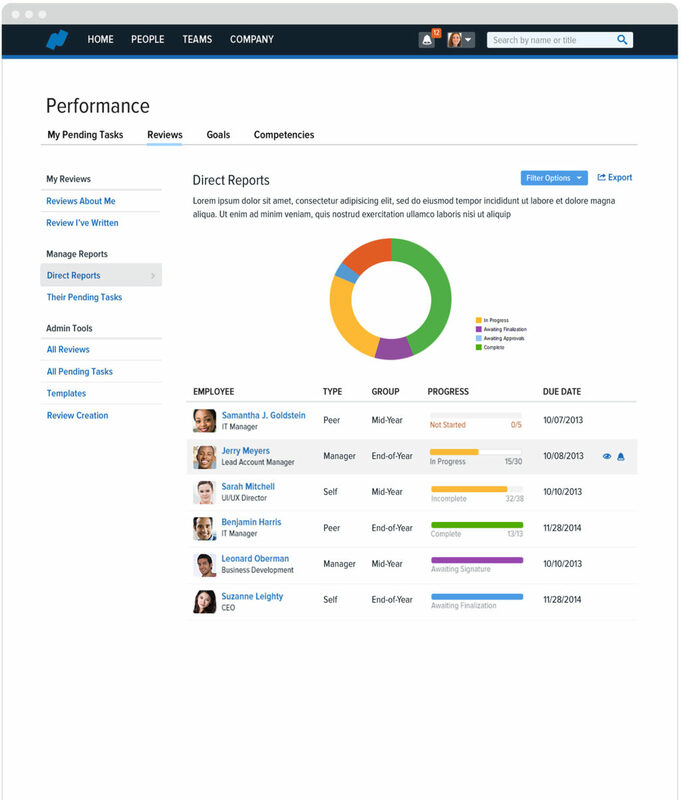 An example of performance reports and talent management features from Namely. Neither Namely or Zenefits provide learning and professional development features. Namely’s accounting features handle local, state and federal payroll tax filing and documentation. Employees can access and complete W-2, 1099, 1094 and 1095 forms with Namely. Namely holds the advantage in the category of accounting; Zenefits does not provide accounting features. The race between Zenefits vs Namely is close, as these two human resource management systems share many of the same benefits — and shortcomings. Ultimately, Zenefits emerges as the more complete HR tool. What it lacks in some areas, the software makes up for it with its workforce management features, onboarding functionality and user-friendly, app-based interface. Do you agree Zenefits is the superior HRM software? Let us know in the comments!